Before we spend many hours researching a company, we’d like to analyze what insiders, hedge funds and billionaire investors think of the stock first. We would like to do so because the elite investors’ consensus returns have been exceptional. In the following paragraphs, we find out what the billionaire investors and hedge funds think of Teleflex Incorporated (NYSE:TFX). Hedge funds don’t think much of Teleflex as of late. It was one of 10 Stocks Hedge Funds Ditched in Q3 Just Before the Market Crushed Them and unsurprisingly, it also failed to rank among the 30 Most Popular Stocks Among Hedge Funds, as just 17 hedge funds tracked by Insider Monkey are still shareholders of the company. What have hedge funds been doing with Teleflex Incorporated (NYSE:TFX)? At the end of the third quarter, a total of 17 of the hedge funds tracked by Insider Monkey were bullish on this stock, a 39% fall from the previous quarter. 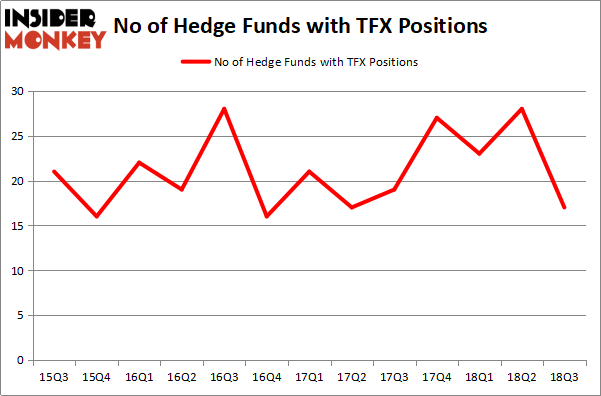 Below, you can check out the change in hedge fund sentiment towards TFX over the last 13 quarters. So, let’s review which hedge funds were among the top holders of the stock and which hedge funds were making big moves. When looking at the institutional investors followed by Insider Monkey, Robert Joseph Caruso’s Select Equity Group has the largest position in Teleflex Incorporated (NYSE:TFX), worth close to $418.6 million, comprising 3.1% of its total 13F portfolio. Sitting at the No. 2 spot is Marshall Wace LLP, managed by Paul Marshall and Ian Wace, which holds a $74.8 million position; 0.6% of its 13F portfolio is allocated to the stock. 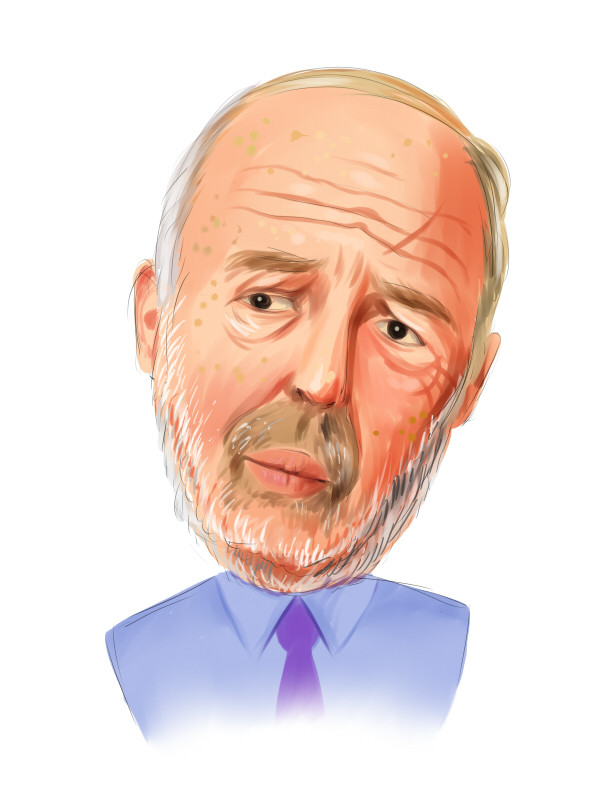 Remaining hedge funds and institutional investors with similar optimism contain Jim Simons’ Renaissance Technologies, Anand Parekh’s Alyeska Investment Group and Samuel Isaly’s OrbiMed Advisors. Seeing as Teleflex Incorporated (NYSE:TFX) has faced declining sentiment from hedge fund managers, it’s easy to see that there lies a certain “tier” of hedge funds that slashed their entire stakes by the end of the third quarter. Interestingly, Brian Ashford-Russell and Tim Woolley’s Polar Capital cut the biggest stake of the 700 funds watched by Insider Monkey, comprising an estimated $45.6 million in stock. Christopher James’ fund, Partner Fund Management, also cut its stock, about $45.5 million worth. These moves are interesting, as aggregate hedge fund interest fell by 11 funds by the end of the third quarter. Let’s now take a look at hedge fund activity in other stocks similar to Teleflex Incorporated (NYSE:TFX). These stocks are F5 Networks, Inc. (NASDAQ:FFIV), Arch Capital Group Ltd. (NASDAQ:ACGL), AXA Equitable Holdings, Inc. (NYSE:EQH), and Sociedad Quimica y Minera (NYSE:SQM). This group of stocks’ market valuations are similar to TFX’s market valuation. As you can see these stocks had an average of 18 hedge funds with bullish positions and the average amount invested in these stocks was $718 million. That figure was $728 million in TFX’s case. F5 Networks, Inc. (NASDAQ:FFIV) is the most popular stock in this table. On the other hand Sociedad Quimica y Minera (NYSE:SQM) is the least popular one with only 9 bullish hedge fund positions. Teleflex Incorporated (NYSE:TFX) is not the least popular stock in this group but hedge fund interest is still below average. This is a slightly negative signal and we’d rather spend our time researching stocks that hedge funds are piling on. In this regard FFIV might be a better candidate to consider a long position.